The information in this report presents a series of details that may not be of interest some of you, but it is necessary for documentation purposes. 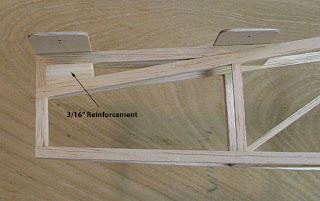 A 3/16" piece was glued in under the stab's rear plywood support on each side to reinforce the single vertical post as shown below. 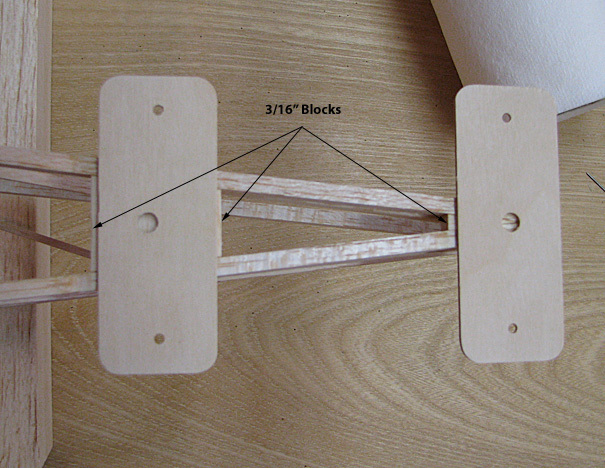 Two additional 3/16" blocks were glued in between the top longerons under the stab's front plywood support as shown below. This ties the front support solidly to the longerons. In this top view, you can also see the "V" block under the rear support. Notice that the blocks extend out beyond the plywood supports and will serve as a shelf or ledge to glue the top 1/16" sheet planking to. 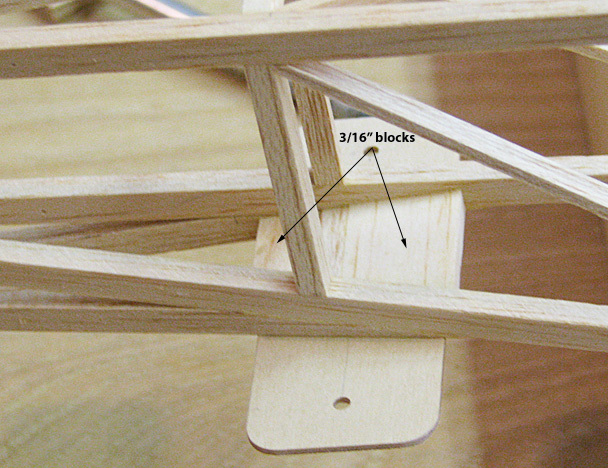 A fuselage transition (or fairing) is required in front of the stab' leading edge. This was made out of 1/4" soft balsa and the back face was lined with 1/64" plywood veneer as shown below. 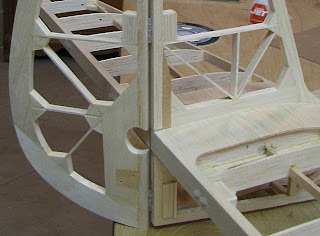 The picture below shows the completed stab platform on the rear of the fuselage, which includes the top 1/16" sheet flush planking and the fuselage transition on the front. This fuselage platform provides a really nice interface for the stab to fit on to. 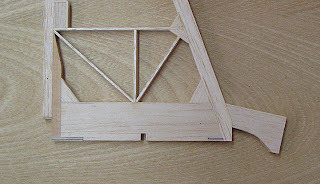 The next detail to be addressed is the small fairing at the base of the fin's leading edge. A piece of 1/4" sheet balsa was cut out and glued in place as shown below. 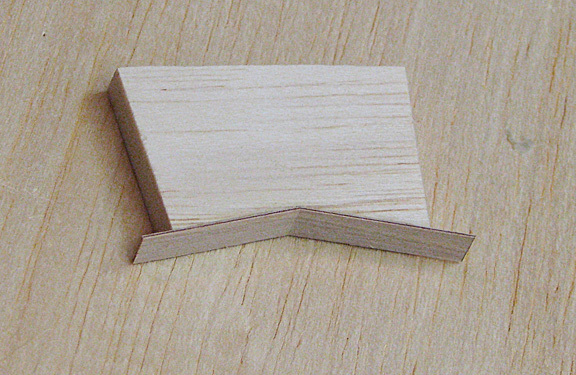 The outline of the piece was then cut and sanded to fair into the stab leading edge point as shown below. 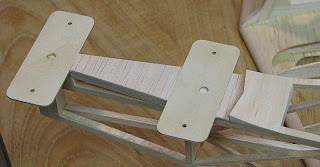 The actual shaping will be done when the leading edge of the fin is trimmed and shaped. 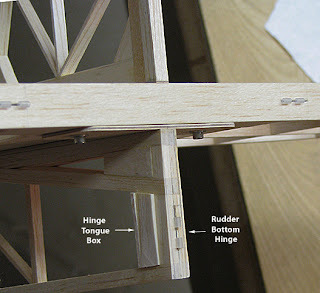 The last detail in this series was the third hinge to complete the rudder's three hinge support. This was installed just below the rudder's control horn plywood base as shown below. The location of the rudder's bottom hinge requires a hinge half in the fuselage's rear tail post near the bottom as shown below. Notice that a box was made to cover the hinge tongue protruding through the tail post.